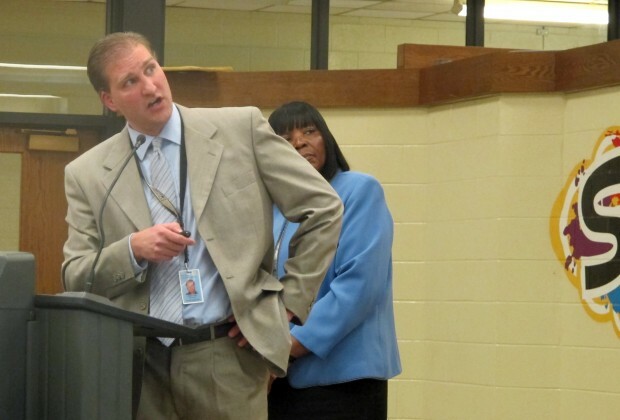 Facilities Manager Darren Hess and Snider High School Principal Deborah Watson explain Fort Wayne Community Schools' plan to renovate 36 buildings. As a rule of thumb, for every ten cents a school corporation asks for when proposing a tax levy increase, it knocks a percentage point off the number of voters supporting the referendum. Before 2008, Indiana school corporations could levy up to $2 million without asking for taxpayer approval. But changes to how schools are funded have sent an increasing number of districts to the ballot box in the last five years. Only 16 of the 40 districts that have pursued major construction projects have succeeded. That has DeBoer and others who study school finance curious about the future of facilities maintenance in Indiana schools. On a rainy Wednesday, Tuttle Middle School Principal Jay Strickland cracks open a window in his office to show off the brickwork on the 52-year-old building. 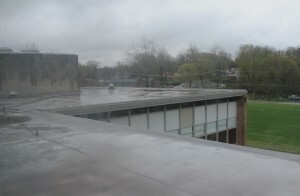 Rain puddles on the roof at Tuttle Middle School in Crawfordsville. The district will break ground on a new school in fall of 2013 and demolish the old building once it's ready to house students. It’s not just the principal’s office, but the whole school. Water comes in through the windows, through the roof, even up through the floor. Last year workers had to jackhammer through the tiles in the main corridor to fix a leak. “We called it Lake Tuttle for awhile,” says Strickland. But Tuttle students and teachers won’t have to live with rotting ceiling tiles and drip buckets much longer: In 2015, Crawfordsville will open a new middle school, paid for with a $35 million construction referendum that passed last spring. Crawfordsville Superintendent Kathy Steele says timing was everything. “Our high school is 20 years old, so our high school is going off the tax rate at this point and time,” she says. If the district could sell the increase as tax neutral, voters would be more likely to approve a new school. The strategy worked: The referendum passed with nearly 80 percent of the vote. But not every referendum passes so easily. “I think early on we saw some bond issues proposed, some construction projects proposed, in the old mode where the school corporation would say it would be nice to have to do all this refurbishing, it would be nice to add this auditorium — and the voters just voted it down overwhelmingly,” says DeBoer. 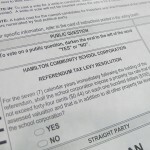 Should School District Referenda Only Appear On The Ballot In General Elections? That’s exactly what happened when the Fort Wayne Community School District first asked voters to approve a levy increase. Last spring voters approved $119 million in building repairs at 36 of the district’s schools, including major construction at Snider High. Built in 1964, many of the pipes below the school are rusted and in need of repair. But when construction is done at Snider, district facilities manager Darren Hess says the district will ask voters for another $120 million to renovate two other high schools. Superintendent GiaQuinta says the plan is to continue pursuing construction referenda at a pace that keeps the tax rate constant. “We think we’re using the mechanism that was established by the legislature to do major repairs,” he says. Remember — Indiana is relatively new to referenda. Neighboring states have been asking voters to approve levy increases for years, and DeBoer says it’s too soon to tell if Indiana schools will be forced into a constant cycle of referenda to keep their facilities updated. But if that’s the case, he says it could lead to inequalities between school corporations. 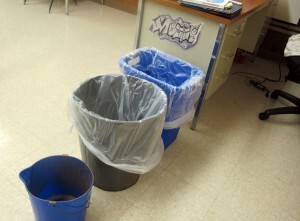 It's a common scene at Tuttle Middle School in Crawfordsville: Classrooms lined with trash cans to catch the rain leaking from the ceiling. The district will open a new school in 2015. “And since the tax rate seems to matter — at least some to degree, where the higher tax rate that you ask for, the less likely you are to pass — well, one of the reasons you have to ask for a higher tax rate is if your assessed value is low,” he says. Fort Wayne is the state’s largest school corporation. It only had to ask for a 14-cent levy increase to raise $119 million. But Crawfordsville had to ask for 65 cents to raise $35 million. And if you think smaller districts require less building maintenance, Superintendent Steele says think again. “There’s always a roof that needs to be repaired,” she says. By the time the new middle school is built, the high school will be 25 years old — and, Steele says, probably in need of some upgrades.